Family Roleplay is one of the most popular types of communities in Second Life. Just like in real-life we all want a sense of belonging and feeling the security of a loving family unit. We build friendships that can become long-lasting bonds that feel like relatives and even blossom into love with the right type of nurturing. 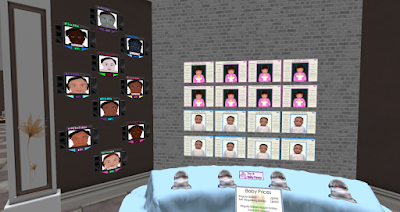 Interactive babies have become a special addition to building a family in the virtual world. Couples seeking something more to strengthen their relationships have the opportunity to create a life that is a combination of both parents. Looking deeper into parenting in Second Life, it also gives people who are past child bearing age or those unable to conceive in the real world, a chance to feel that special bond between parent and child. I’m not saying it is the same thing, but it does fill a void for many who long for a family of their own. 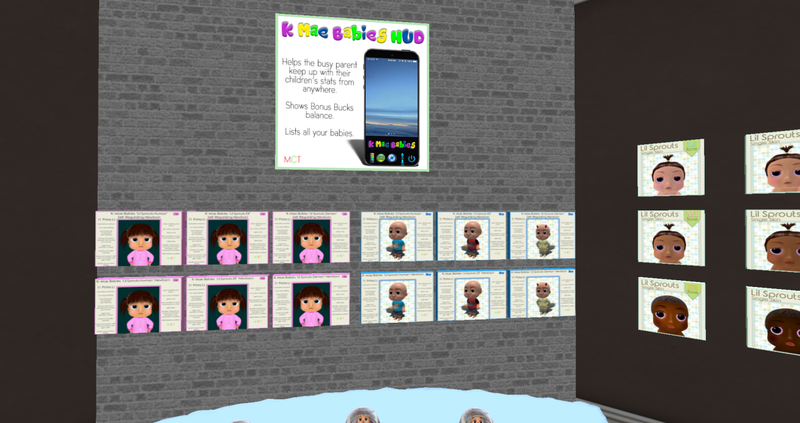 The Second Life Enquirer met up with the creator of K-Mae Babies & Toddlers; Singerman Marquette to learn more about these interactive babies and how they compare to the other brands in Second Life. Singerman, Tell our readers a little bit about yourself. Where are you from and how did you discover Second Life? I’m from the Southeast United States and do electrical maintenance on various rental properties in my local area as well as developing content for Second Life. I also have a 13 year old daughter who I’m raising on my own. 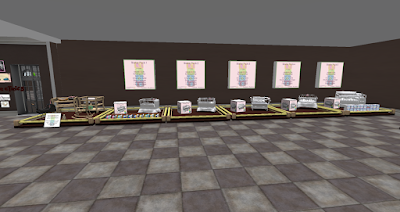 I have a prim baby business in Second Life (K-Mae Babies), as well as a full perm mesh kit business (Prims n Things), a kids items business (K-Kids) and a bento mesh avatar business (Boo Fever). I also do custom projects for various clients in SL which often times includes making custom models, textures and scripting. What inspired you to create K-Mae Babies & Toddlers and when was this brand established? My wife, Lori, and I had a baby brand and clinic called Binky Babies around 2008.. I built the babies and items to go with and she handled the rest, including clinic operations. They were basic prim babies that were really high prim and designed to be held by the parent. She passed and when mesh came to SL I decided to remake the brand, to keep the tradition going in her honor, and named it after our daughter Kayley Mae (K-Mae for short). Are you the only creator of K-Mae & Toddlers or do you have a team of developers? We have a team of developers which includes myself, a couple of excellent script gurus and a couple of graphic artists. We are from all over the world and have come together to bring you great, affordable products for your SL family roleplay. What are the features you can expect from K-Mae Babies & Toddlers? One of the main features that has made K-Mae so popular is its ability to be customized in many different ways by using accessories such as skins, eyes, nail polishes, hairstyles and clothing/accessory options. Another great feature is the lifelike smooth movements and animations package. We spent many weeks developing these unique animations. Low maintenance cost is another feature our parents love about K-Mae. We offer 4 styles of regular K-Mae children and also 4 styles of our latest additions, the Lil Sprouts, which are more on the cartoony side and have their own clothing/accessory system. We offer all of these in the regular variety, which require food, diapers and other care items to maintain. We also offer them in Self-Regulating, which never need any maintenance items or foods. You’ll never have to worry about losing your K-Mae child. We have an in-store recovery system, so if SL gets hungry, or if your partner or anyone else takes off with your little one you can come to the store and do a recovery to get your child back. You can also expect great customer service. I know how it feels to be the victim of bad customer service so I ensure our parents never have that experience with K-Mae. What types of furniture and accessories are required to maintain these babies & Toddlers? Furniture for a newborn isn’t required, but we do offer a wide selection of nursery furniture for those parents who want to set up a nursery in their home. We even have Starter Packs, which contain everything you’ll need to set up your new nursery. When the child is a little older (26+ weeks) he will need a high chair and food for it. When the child reaches 78 weeks he will then need a toddler table. Fortunately we offer a feeding item that is both a high chair AND a toddler table. It converts to the different configurations via menu and will hold both baby food and toddler meal components. Also when the child reaches 78 weeks he will need a Toddler Potty. Beds and cribs aren’t required, but they are a nice way to furnish your child’s room. We have several bed options to choose from, and a lot of bedding texture options for each bed. You can even get a Bedding Creation Kit and make your own beddings! Can you customize your baby’s appearance? Yes, by using our available eyes, skins, hairs, earrings, base clothing and mesh clothing/shoes. Also if you want to do your own customizations you can purchase our Developers Kit which has models, templates and full instructions on how to make clothing and accessories for your K-Mae child. In addition to that we have a program where I can turn any single-prim item you have (providing it’s full perm to you) into an addable which you can sell of have your baby use. Addables are external items, such as mesh hair, shoes, clothing or other accessories, which link to your K-Mae child via menu. Do the newborn grow into toddlers or do you have to purchase the toddler version at a certain age? Our babies start as newborns and will age to 6 years old (312 weeks) on their own, at a rate you choose. The baby has an Aging Ratio option, which can be set to 0 for Off (no aging), 1:1 for aging in real time, 2:1 for aging 2x faster than real time, or 4:1 for aging 4x faster than real time. They don’t need anything special to develop, learn and grow, like with some other brands. They do all this on their own. We also offer an aging alternative for parents who are switching to K-Mae from another brand and want their K-Mae to be around the same age as the one they’re replacing. This option is a product called Booster Bears, which can age the child to various ages (1-6 years old in yearly increments), or 4 weeks at a time, depending on which bear they get. Are there various stages that allow them to learn new things or interact with other K-Mae children? They interact with other K-Mae children on their own, as well as interact with their parents and people on their Buddy List. Also people who are on their Buddy List have limited access to the baby menu to do basic care functions. Being on the Buddy List also allows them to use furniture owned by the child’s parents with that child. Can they become ill if they are not tended to for a period of time? If so, do you have clinics and medication to help care for the little ones? Yes. If not fed or diapered for a day or so their Health and Happy stats will start to decline. When these stats reach a certain level the baby’s text will turn Yellow, indicating action is needed or baby will get sick soon. If baby continues to be neglected the stats will continue dropping until the text turns Red. At this point the child will need medicine to get his Health stat back up. The Happy stat can be raised by a number of methods including toys or our baby bath. There are a few K-Mae clinics which can tend to your baby’s health needs. There is an area in our store dedicated to these clinics, near the entry. Just click their sign for info. For couples planning on starting a family, what is the price range for the necessities required to take care of K-Mae babies & Toddlers? The child itself will cost around L$2900 and at this point the furniture is purely optional, but you will need at a minimum a Care Bag or a Refillable Diaper Box to hold and dispense diapers and meds, and some bottles. The care bag costs L$299. We have many texture options for these. The Refillable Diaper Box costs L$10 and only works for diapers. The diapers which go into the care bag or diaper box cost L$50 for 100, and our bottles cost L$1 for 100. The bottles go into your baby’s storage upon purchase so they’re always handy when needed. We also offer furniture which has the Lifetime Diapers feature, meaning you’ll never need to purchase diapers for that item. We even have a crib with this awesome feature! The babies have a breastfeeding option for parents who want to go that route, and we offer a breastpump system for breastfeeding parents on the go. There are a variety of HUD and Clinic options for expectant couples to use. Are there pregnancy and delivery HUDs specific for K-Mae babies? Do you have any recommendations for expectant couples on where to start and what HUDS work best for a realistic experience? I personally don’t have much experience with the wide variety of pregnancy HUDs out there, but we have a group (K-Mae Babies) with lots of parents who have probably used them. New parents are always encouraged to chat in our group with other parents to help them learn how K-Mae works and to get advice on pregnancy/maternity products, even if they aren’t K-Mae brand. 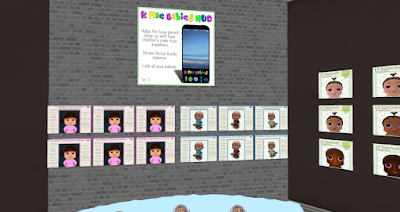 Compared to other interactive baby brands in Second Life with costs ranging between 2,300L-12,000L on babies and supplies, what is the average budget for couples who are looking to start a family with K-Mae babies? The baby costs L$2900 for regular and L$6000 for Self-Regulating. For the regular babies the monthly cost for maintaining their stats can go from around 2 USD per month to 10 USD per month, depending on which feeding/diapering options you choose. We offer a wide variety of stat maintenance options including a nanny system, which tends to all of your baby’s stats, and can tend to up to 1000 babies on the same sim. Some of our parents have over 40 K-Mae children, so this is a handy system to own for them. Other feeding options include Rez-n-Go foods, which you’d rez out for your child 26+ weeks and they’d go to it and eat it when they get hungry. We also offer our Convertible Feeding Table, which converts from high chair to toddler table via menu. It holds baby foods plus toddler meal components and even has a nifty texture changer built right into the menu with many texture options. What sets K-Mae Babies & Toddlers apart from the other major interactive babies in Second Life? I think one major thing that sets K-Mae Babies apart from other brands is that we want Second Life parents to be happy with their family roleplay, no matter which brand they decide upon. I model and texture most of our items myself, and with some of the more popular items I have full perm kits I sell. Some other brands have purchased them to sell to their customers. I want to share my creations with all the parents in Second Life, not just K-Mae parents. Also we won’t ban people from our sim just because they bring another brand child to our store. We realize parents sometimes buy other brands in addition to their K-Mae’s and we’re ok with that. If they want to bring their other babies along while they shop at K-Mae it’s perfectly fine. Another thing that sets us apart is that we’re not all about the money like some other brands are. We offer FREE lifetime updates for our children. Any time there is a baby update each parent can come to our store and get the latest version replacement, for free. 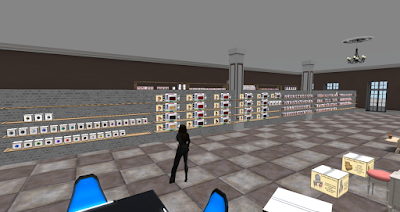 We keep prices low as possible because we think family roleplay in Second Life shouldn’t cost a fortune. We do have to charge something of course, to pay overhead, tier, and development costs, but we’re not here to rip anyone off. Customer service is a big deal in Second Life, especially for new parents that need guidance in caring for their little ones or getting helpful advice. Do you have a group for support? If so, what type of notices and offers can K-Mae group members expect? We do have a support group in Second Life called K-Mae Babies. Any parent can ask questions in group chat when they need assistance, or they can contact me directly inworld. My offline IMs go to email, so I’ll get your message even if I’m not logged in and will reply as soon as possible (usually within 1-2 hours). Nobody likes to wait days or even weeks for product support. Most of the time when a new parent asks for assistance in group chat, another parent will step forward and offer to help. We’re a tight knit community and always there to help and support each other. Also the baby comes with a 5-note card Care Manual. It is split into sections to make it easier to find the info you’re looking for, and each of our products also has an Info card, so you’ll know how to use the item. We don’t send a lot of spammy notices, as we find those to be annoying. We do however send notices when we release a new product or feature update. Also our affiliates will send notices in group when they have new releases, and of course we send a notice at the first of each month to announce the Monthly Group Gift, which parents can get from our store. Usually it’s a new Addable toy or something else baby can have fun using. 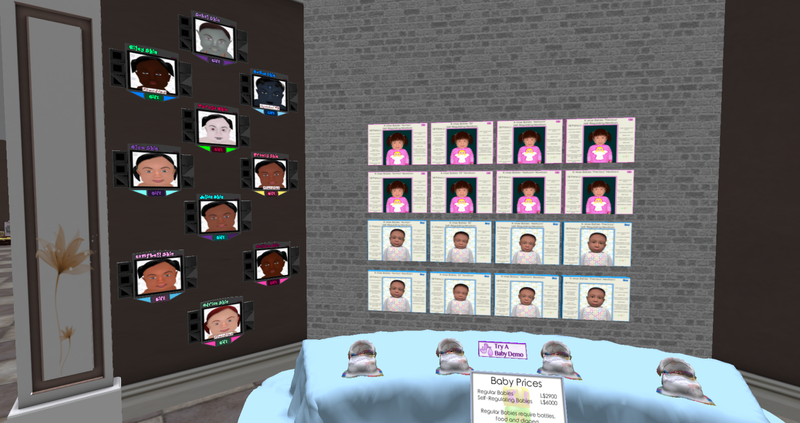 Why do you think the interactive babies are a top ranking industry in Second Life? I don’t. In fact I think it is a very limited market, limited to those who want to roleplay having a family in Second Life without adopting a child avatar, but I enjoy what I do and our parents love their K-Mae children. Is there anything else you’d like to share with our readers about K-Mae Babies and Toddlers?